Make a dream come true; step aboard to explore the hidden treasures of Oman’s magic coastline. This 2 hour cruise will give you a fascinating experience and its rare to miss the swimming dolphins. Chances of seeing dolphins (usually common, spinner, bottlenose or Indo-Pacific species) are high at any time of the year. A dolphin in flight is a wonderful sight that thrills onlookers. 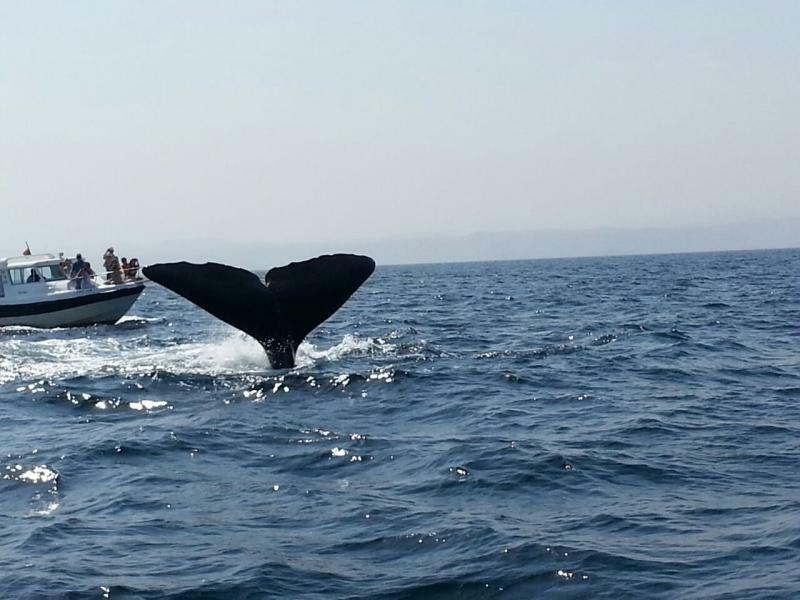 We operates Dolphin and whale watching Watching tour in Muscat, Oman every day. The trip starts at 8.00 am, 10 am & 12 noon. Reporting time 15 minutes prior to the trip. Transportation can be arranged from any hotel in Muscat. We operate from Marina Bander Al Rowdha boat club. Refreshment served on board. Dolphins are highly intelligent animals with complex social structures. The first several years of a baby dolphins life is spent very close to his mother watching and learning everything from her and his/her other elders. Everything from navigating and traveling in new areas, hunting different species of fish, and even social skills are learned behaviors. It is because of this that researchers are beginning to study cultural differences in dolphin pods around the world. Just as it is known that pods of orca whales from different areas have distinct dialects, the same applies to other cetaceans and their habits.﻿It is necessary to remember about dolphins has been living in this area for millions of years before the arrival of humans and that they lead rich and busy lives. We need to give some Information about dolphins to you and the fact that they have many priorities and they sometimes need their privacy and space. Wild dolphins are also very spontaneous and can sometimes go from feeding to sleeping, to playing and mating within 20 minutes time. The following are some examples of dolphin behavior you may witness on one of our excursions to the dolphins’ home. Dolphins are champions at catching fish and it is a joy to have the privilege of watching their strength, speed, and agility in action. When dolphins are feeding we always watch from a distance. This is a great time for topside observation and zoom lens photography. The following photos show the dolphins chasing and herding fish cooperatively and individually. Dolphins also need time, about 8 hours a day, to rest and sleep. Dolphins and whales have the unique ability to sleep with only half of their brain at rest at a time. Because dolphins are conscious breathers, meaning they must actively decide when to breathe, it is just not feasible to be fully unconscious to sleep. By only shutting down half of their brain and alternating sides, they are able to get the rest they need and still come to the surface for a breath of air. As shown in the photos below, bottlenose dolphins will typically get in a line abreast formation, side by side, and slowly swim along while taking slow, deliberate breaths. These photos show classic pod geometry that is typical of their sleeping behavior. When we find a group of dolphins in sleeping mode, we will shut down our engines, watch from a distance and allow the dolphins to pass undisturbed. When dolphins are in a playful, social mood they are full of energy and exuberance. Social time usually starts off with several dolphins swimming together, rubbing pectoral fins, and being extremely tactile with one another. Sometimes the younger dolphins and babies will play games with one another, tossing a sand dollar, playing tag with a piece of seaweed, and even wrestling each other. Some of these behaviors even mimic adult dolphin mating behavior. This playful time is when they are most likely to interact with humans and will often seek out boats to surf along with. Dolphins are extremely intelligent and their interest in us is often based on curiosity and spontaneity. Sometimes they can’t resist bow-riding or just coming over to greet their old friend, ‘Patty C.’ The following photos show dolphins flirting, playing, mating and socializing.